Staff attorney Raúl Carrillo delivered our message at a rally organized by Fed Up: The National Campaign for a Strong Economy to demand the appointment of an accountable president of the Federal Reserve Bank of New York. Our Raúl Carrillo delivering these comments on March 12, 2018. Click here for video and here for more photos of the event. 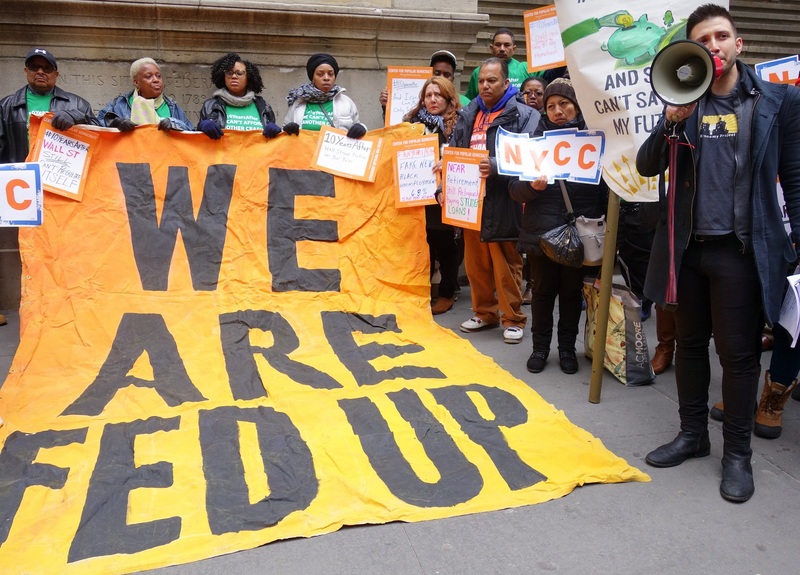 For the past 23 years, our organization, New Economy Project, has helped New Yorkers and community groups fight discriminatory banking practices that perpetuate poverty, inequality, and segregation. We work alongside groups in neighborhoods all over New York City that are reeling from predatory lending, foreclosure, eviction, job loss, and other problems caused by Wall Street. Given our deep ties to community groups, we often see problems as they’re emerging and try to alert the public and the powers that be, before they get worse. As far back as 20 years ago, New Economy Project and many of our community group partners in the New York Fed’s district repeatedly warned the Federal Reserve Bank of New York about signs of the looming subprime lending and foreclosure crisis. In the 1990s, we brought the New York Fed evidence of the crisis already unfolding in NYC communities of color, and pressed the agency to regulate. To supervise. To do its job. New Economy Project convened meetings with community-based groups and the New York Fed President and his staff to alert the Fed to system-wide distress. 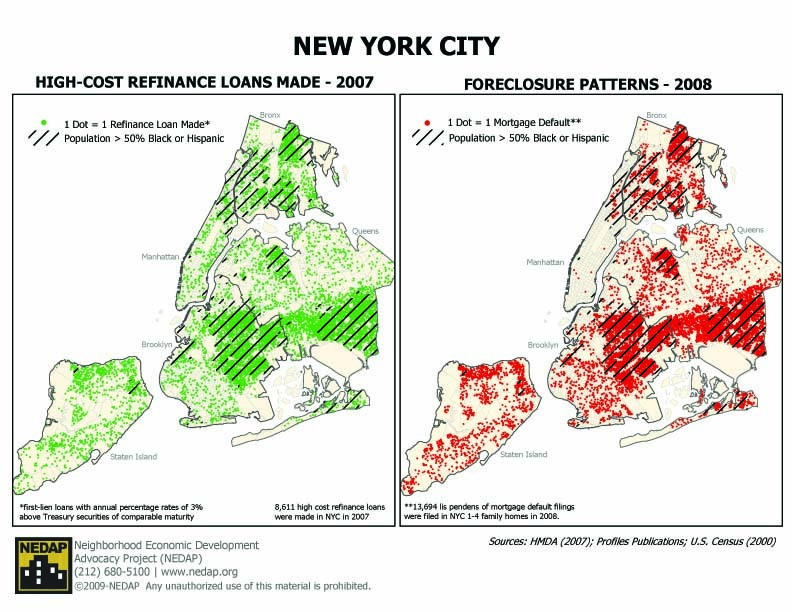 We documented for the Fed the waves of subprime mortgage lending and foreclosures that were devastating Jamaica, St. Albans, Rosedale, and other Southeast Queens communities; Bedford-Stuyvesant, East Flatbush, and the rest of Central Brooklyn; Williamsbridge and Wakefield in the Bronx…virtually every neighborhood where black and Latino New Yorkers owned their homes. We even trained Fed examiners on the red flags. But the New York Fed did not listen to community groups. In the 1990s, after decades of redlining, Wall Street found new ways to exploit and extract wealth from black and Latino communities. But the Fed ignored reports and evidence that banks were much more likely to make toxic loans to black and Latino borrowers than to white borrowers with the same credit score. From 2005 to 2009, from the run-up to the crisis and ensuing meltdown, household median wealth for whites fell by 16%. Meanwhile, median wealth for blacks was cut in half, and median wealth for Hispanics fell by two-thirds. Minutes from the Federal Open Market Committee – in which the New York Fed plays a key role – failed to mention race or racial discrimination even once from 2007 to 2008. Not once in 1,800 pages did Committee members observe that maybe something was going down that was particularly bad for blacks and Latinos. By willfully ignoring racial discrimination in the housing market, the Fed refused to acknowledge the magnitude of what was happening. Most black and Latino wealth is tied to housing value, so when the bottom fell out, tens of millions of people lost everything. When the Great Recession then hit, sales stopped, borrowing stopped, employers cut jobs, especially for black and Latino folks – but also for everyone, for all working people. When the crash happened, it was then-New York Fed President Tim Geithner who led the push to bail out the banks, not the people. A lot of powerful policymakers with ties to Wall Street said that as long as the banks could make a safe landing, everyone else would be alright. For many, there has been no recovery. From 2010 to 2013, the so-called “recovery” period, wealth inequality widened along racial and ethnic lines. White median household wealth increased by 2.4%. Meanwhile, black median wealth fell by 33%, and Hispanic median wealth fell by 14%. Ten years after the crash, many of us are worse off than we were before the crash. And now the Fed wants to tell us that things are fine. That it can raise rates again, that it can deregulate again, that it doesn’t need to push for full employment. Fed officials act like they don’t remember what happened 10 years ago – and in the 10 years before that. But we can’t forget, because we’re still living with the consequences. Black and Latino New Yorkers are still reeling from the foreclosure crisis and bearing the brunt of the Great Recession. We’re still trying to clean up after the last crisis and we cannot afford another one. Wall Street banks may be able to afford it. The Trump Administration may be able to afford it. But 145th Street cannot. Fulton Street cannot. Jerome Avenue cannot. Jamaica Avenue cannot. Puerto Rico cannot. People sharing their stories here today are going to tell us why. The New York Fed needs to listen. Wall Street does not listen to communities, no matter how much we warn them. Wall Street cannot regulate itself. That’s why we can’t afford a New York Fed president who comes from Wall Street. We don’t need bankers, we don’t need hedge fund, asset, or private equity managers. We need someone who will welcome and act on public input and stand up to Wall Street. The Federal Reserve should answer to the people. By law, the Fed is the creation of Congress, and thus the people, yet every New York Fed president has worked for Wall Street before, during, or after his tenure. And I say “he”, because they’ve all been men. And they’ve all been white men. The New York Fed president is one of the most powerful positions in the country that Trump doesn’t control. Who runs the New York Fed matters. We call on the New York Fed board and the Federal Reserve Board of Governors to appoint a NY Fed president who will put the interests of workers, communities, and the general public first. The banks already have way too much power – we should not allow them to continue controlling the New York Fed. Read our co-directors’ statement on the appointment of the new New York Fed president here.